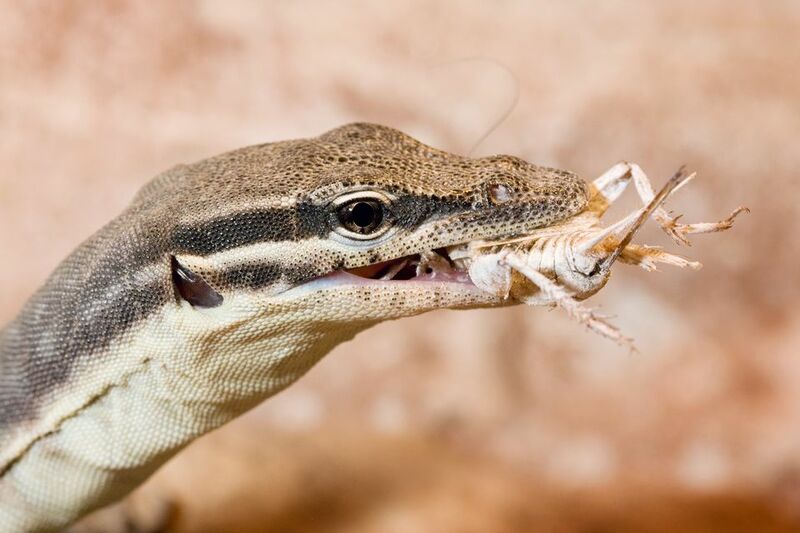 Many reptiles and amphibians, especially pet lizards, eat primarily feeder crickets. These crickets are not usually caught from the outdoors but instead purchased from a variety of cricket suppliers. Some people have success in breeding their own cricket colonies while others make weekly runs to the store or have regular deliveries of bulk crickets sent to their homes. Let's take a look at your cricket supplier options. This cricket farm is located in the state of Michigan and carries seven different sizes of tropical house crickets in addition to five kinds of worms (giant mealworms, mealworms, superworms, waxworms and hornworms). You can schedule a time to pick them up in person if you are within driving distance, can order them through their online store, or purchase them at one of the stores they supply. The smallest quantity of crickets you can purchase is 250 and the price is the same for all seven sizes. Shipping costs are additional to the crickets. Top Hat Cricket Farm is a family owned business that has recovered from the 2010 virus that killed off their entire acheta house cricket species population hence the reason they now sell tropical house crickets. This large corporation was founded by Richard Fluker in 1953 in Louisiana to supply the fishing industry. Since then it has grown into one of the largest live insect suppliers in the country and breeds not only crickets but also worms, cockroaches, fruit flies and pet reptiles. Fluker's also sells food products to gut load feeder insects. Fluker's Cricket Farm offers seven sizes of crickets sold in a variety of quantities with 100 being the smallest available online. The company ships their crickets directly to your home but you can also find their crickets in many pet stores across the country. Shipping costs are additional to their products. They've proudly bred their version of the house cricket which they call the "American Mix." This online supplier of crickets sells their crickets starting at a quantity of 110 and also sells cricket eggs. They offer nine sizes of crickets and also has an option for winter packaging for those reptile owners who find it hard to get crickets shipped during the winter months. Their crickets are shipped from Georgia. Premium crickets also sells other feeder insects and feeder insect supplies. Phoenix worms, butter worms, superworms, mealworms and wax worms can also be purchased in addition to crickets. This online cricket supplier also sells the house cricket, a.k.a. the brown cricket. They offer eight different sizes of crickets in bulk quantities of 500 and larger. They offer special winter packaging and also supply to many pet shops. Armstrong Cricket Farm is located in Louisiana. This online supplier of various feeder insects and feeder supplies will ship quantities of nine different sized crickets ranging from 100 to 10,000 crickets. Another online cricket option is Backwater Reptiles. This supplier sells reptiles, tarantulas, scorpions, and amphibians as well as feeder insects. They have ten different sizes/ages of crickets available and includes overnight shipping in their prices for 500 or 1,000 crickets. They do not offer other quantities of crickets. Eight sizes of crickets are available from this online supplier of feeder insects and supplies. They sell quantities of 250 to 1,500 crickets and ship from Georgia. Most pet shops do not breed their own crickets but instead use one of the aforementioned suppliers themselves. If you do not require large quantities of crickets you may find it more cost effective to simply make a weekly trip to your local pet shop, gut load the crickets at home, and then feed them to your reptiles or amphibians. Many smaller scale cricket breeders and suppliers will make an appearance at your local reptile show or expo. This is a good, cost effective option if you have a regular show in your area and have a large number of reptiles or amphibians to feed. While not for everyone, keeping and raising a large number of crickets is not impossible but it does require some work on your part. Providing proper humidity, cleanliness, food, etc. can be too time consuming and too much work for those who don't see the benefit of raising their own large quantity of crickets. But for those who find themselves spending more money than they can afford to feed their reptile population it may be worth a look at raising their own crickets. A multitude of other online cricket suppliers (such as Carolina Crickets, Mulberry Farms, Dr.'s Foster and Smith, Petco, Millbrook Crickets and Reptile Food, Timberline, Georgia Crickets, Rainbow Mealworms and Crickets, South Florida Rodents, Crickets Direct, Bassett's Cricket Ranch and more) and breeders exist making it easy to find the right source of crickets for your reptile collection. What Do You Feed Crickets Before Feeding Them to Your Pet? What Is Your Bearded Dragon Trying to Tell You? What Should You Do With Your Reptile When You Go on Vacation? How Do You Care for a Pet Bearded Dragon? Is Your Bearded Dragon at Risk for Contracting ADV? What Morphs Do Bearded Dragons Come In? How Does a Bearded Dragon Prolapse and What is it? Can More Than One Bearded Dragon Live Together? What Do Ball Pythons Eat and How Can You Get Them to Eat? Why Is Your Bearded Dragon Glass Surfing? How Do You Care for Tiger Salamanders? What Kind of Lighting Does a Bearded Dragon Need? How Do You Care for Colombian Tegus?